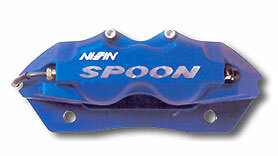 The development of aluminum calipers at Spoon has started in February 1997. Exhaustive circuit testing was conducted, CAE analysis was implemented at the design stage, and on-vehicle confirmation of shearing strength and fatigue strength was carried out. In March 1998, the basic performance of final die parts has been confirmed, final testing was finished during the month of June, and a satisfactory product was realized. In contrast to single-side push calipers, the opposing type of caliper has been designed with a high degree of body stiffness; consequently, the dragging torque value can be lowered and displacement under high oil pressure can be essentially ignored. When performing air bleeding on the normal-configuration vehicle, the entire caliper experiences warping; however, this product is of a different stiffness configuration. Furthermore, by incorporating a 4-pot design, piston area can be substantially increased and more-effective braking can be achieved. Excellent characteristics of the aluminum body: The aim in the development of this product was reduction of spring weight. By adopting aluminum for the body, it was possible to achieve a weight of 2,400 g, approximately half that of the mass-production vehicle, and this can be easily envisaged by considering the difference between aluminum foil and steel foil. By reducing the under-spring weight, it has been possible to improve wheel contact and surface following, and this in turn has realized major increases in sense of driving and riding comfort. Excellent characteristics of the four-pot: Two differing diameters of 42.85 mm and 38.18 mm have been adopted for the four pistons; specifically, the smaller diameter is used for the entry of disk rotation; the larger, for the output side. Accordingly, it has been possible to counteract the self-servo effect, which occurs when the disk rotates during pad application, and as a result, the pressure applied to the disk by the pad has been made more uniform. Also, this improvement enables excellent, stable braking performance to be assured over long service lives.